Ever wanted to feel like a kid again but in an adult jungle gym? No? Are you lost? Okay, my apologies. 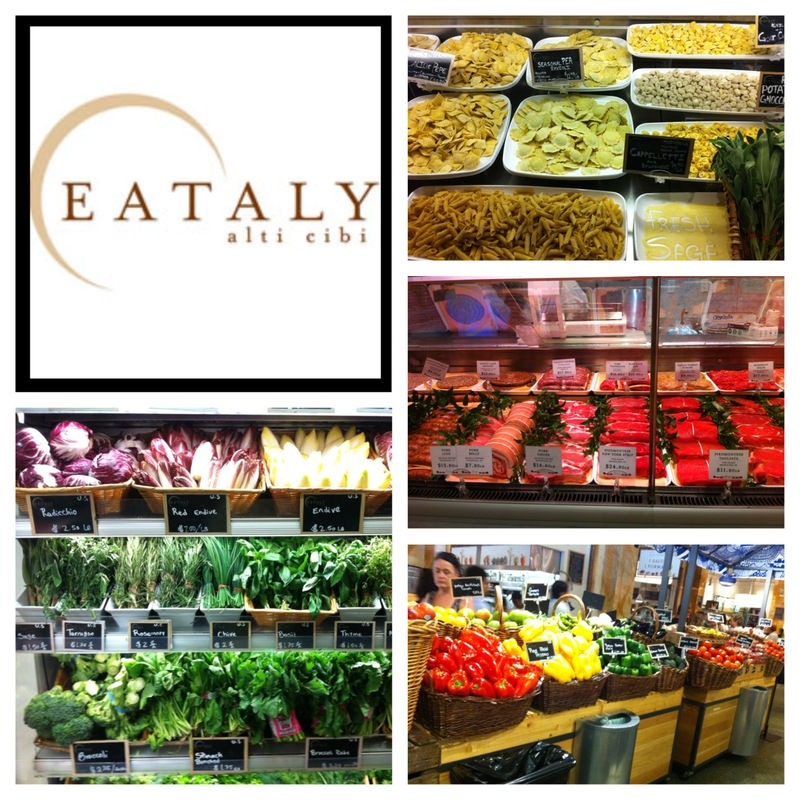 I’m still reeling over my experience at Eataly. A foodie and a New Yorker, I have been dropping the ball HEAVY! Even worse, I work near the Italian paradise. I finally had some free time and ventured over to the much buzzed about market right before I melted (its 96 degrees here today). As soon as I walked in, I saw people milling around testing sauces, tasting wines, slurping gelato, and finishing their afternoon salads. It was magical. I was stuck in place near the revolving door before the smell of fresh bread even hit me. Before, I even knew which way to go. Before I realized I should probably grab a basket and wonder the red brick road to food heaven. It was exquisite. Once I got past the initial shock, I walked right past the Nile River length Panini line and into the cold cuts section. Granted it’s not called the cold cuts section at all. It’s “Salumi” and other things. Forgive me, but my eyes and nose lead the way. I didn’t register the language. Although I surely will the next few hundred times I go. I love prosciutto. I love salami. I love sopressata. Moral of the story? I love cured meats! Therefore, it was no surprise when I stayed in this section over 15 minutes looking at all of my options. In the end, I left with prosciutto aged 24 months, pepper salumi, and extra spicy sopressata. (Is your mouth watering yet?) Not too far, I wondered into the cheese section and grabbed aged provolone cheese. I hung around while an attendant made fresh mozzarella. He spoke and gave tips, but his voice was on mute since I gawked and awed at the cheese making! Look at those greens and herbs! Psh, don’t mind if I do! 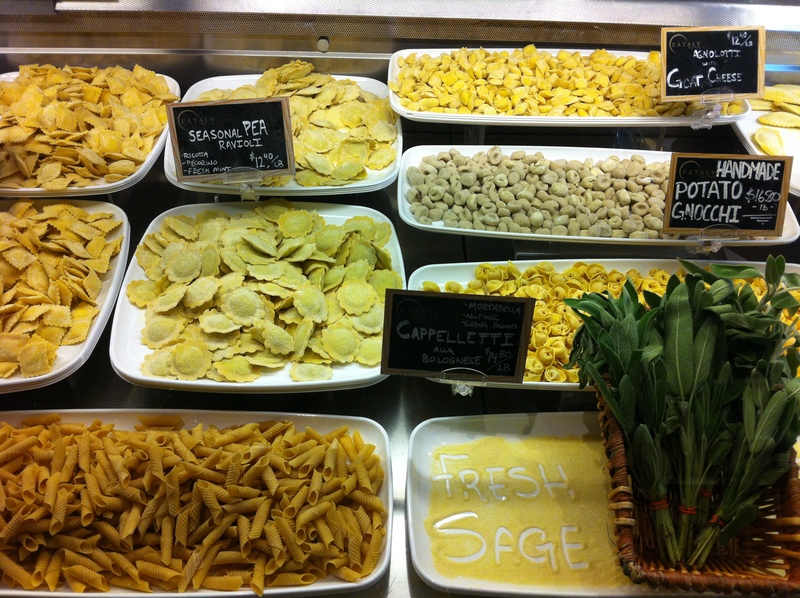 Eataly is more than a marketplace. It also hosts a few restaurants one of which is Piazza. Tall marble banquettes crowd the floor while people eat an assortment of different charcuteries and drink wine. Again, this place was heavenly. No one cared that you bumped into them while you weighed your bag of fresh sundried tomatoes as they guzzled their wine and polished the pesto off their plates. The chaos of the marketplace is welcomed, expected, and treasured. I’m giddy in my seat recalling the memory! The fresh pasta station is all the yelpers crack it up to be. I left with ½ a pound of spinach ricotta ravioli complete with my imported Italian marinara sauce. (Who was I to resist?) I hadn’t eaten lunch yet, and already I was preparing for dinner! Before you knew it, I had circled the place four times, filled up my basket which had now become a cart and sampled the last of the Italian sodas. My lunch break was over and if ever my stomach growled, it was at the checkout line. On cue, the baker restocked the baguettes and I took one for the road. 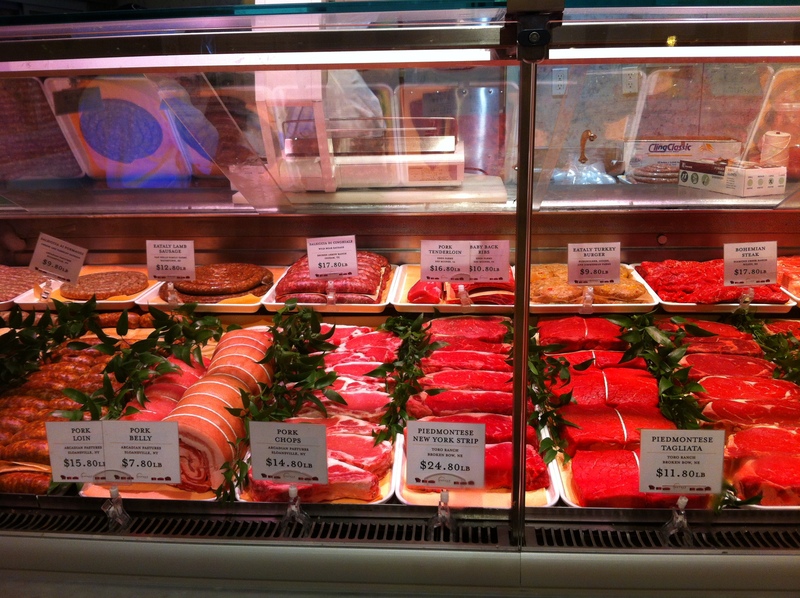 Now that’s a meat department! I exited on 5th avenue and made my way through Madison Square Park. Head held up high with a grin plastered from ear to ear, I walked with a new pep in my step to some happy tunes in my head. 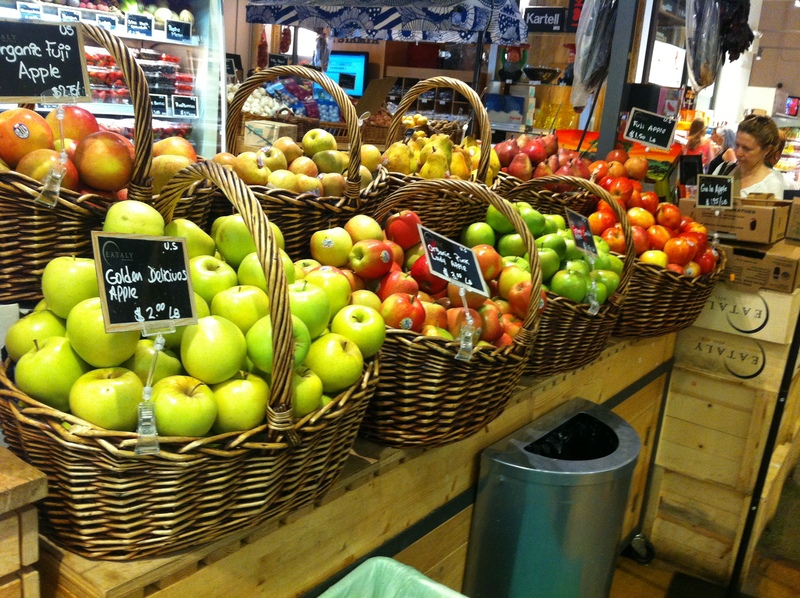 All that fresh food would make anyone happy. 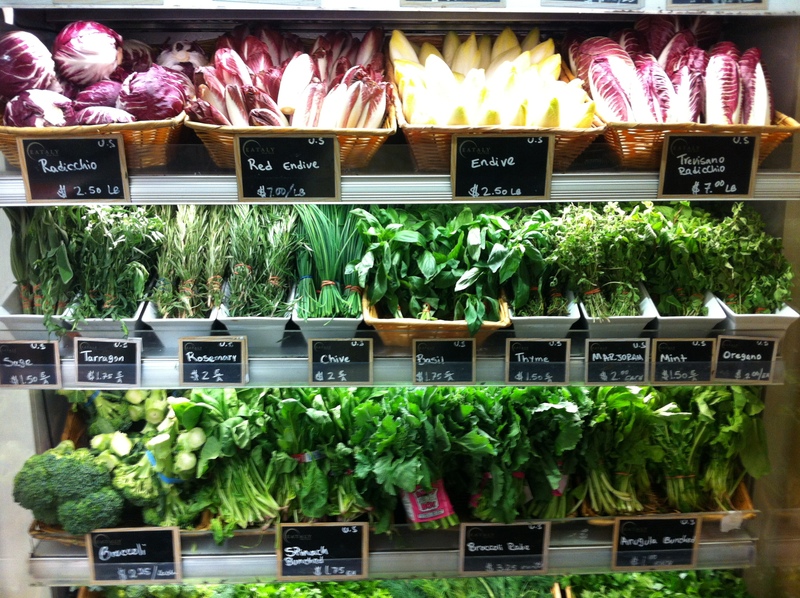 Never mind the crowd, the tourists, or the long lines—Eataly is a New York City gem. Check it out New Yorkers, would be New Yorkers, and visitors. It’s on 24th and 5th just on the other side of Madison Square Park.